Blank Page Muse: New Release Rick ST Dennis~ See No Evil ATCS ~Quick Ideas! New Release Rick ST Dennis~ See No Evil ATCS ~Quick Ideas! I have an ATC set using the new DriBonez set by Rick St Dennis. Use inks on the background and blend the colours. use the DriBonez boarders around the corners. 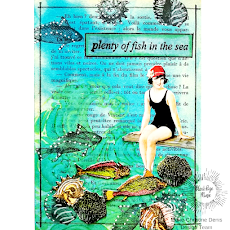 Add texture to the backgrounds using modeling paste and stencils. Stamp out the large skulls onto white card and color. Cut out and adhere to ATC base and finish by adding a few words to the ATC.